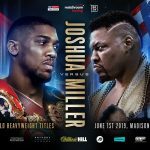 Heavyweight boxing’s biggest star Anthony Joshua OBE will defend his WBA Super, IBF, WBO and IBO World titles against Jarrell Miller in his long-awaited U.S. debut at the iconic Madison Square Garden in New York on Saturday, June 1, live on DAZN in the U.S. and Sky Sports Box Office in the UK. The post Anthony Joshua to Face Jarrell Miller in U.S. Debut at Madison Square Garden appeared first on Round By Round Boxing.